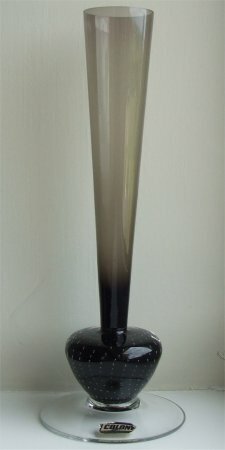 This dark smoked glass vase was made in Sweden. The vase is approximately 260 mm (10 1/8th ") tall. 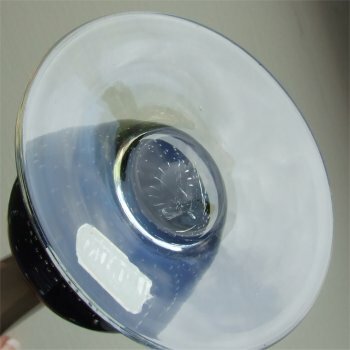 The base is pot shaped and has a wide clear circular base for stability. It has bubbles which come up vertically from the base. It has a coloured core and is encased in clear glass. The stem is the same colour as the base and has a wide flare being approximately 42mm (1 7/10ths of an inch) in diameter. 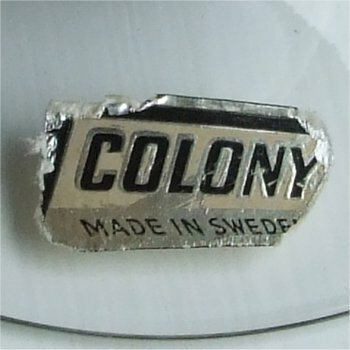 The oblong (landscape) label is gold with black wording stating 'COLONY MADE IN SWEDEN' and has a black border down the lefthand side and across the top. (see images below). 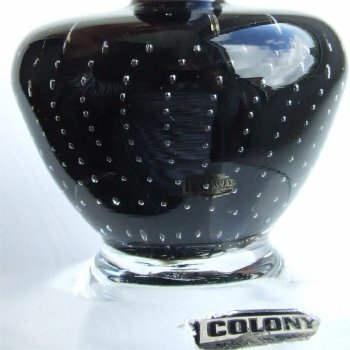 Colony was most likely an importer or distributor of the vase and not the maker.